You Want To Send Money Where? Everyday, billions of dollars travel to thousands of destinations. How much money leaves Canada every year and where does it go? 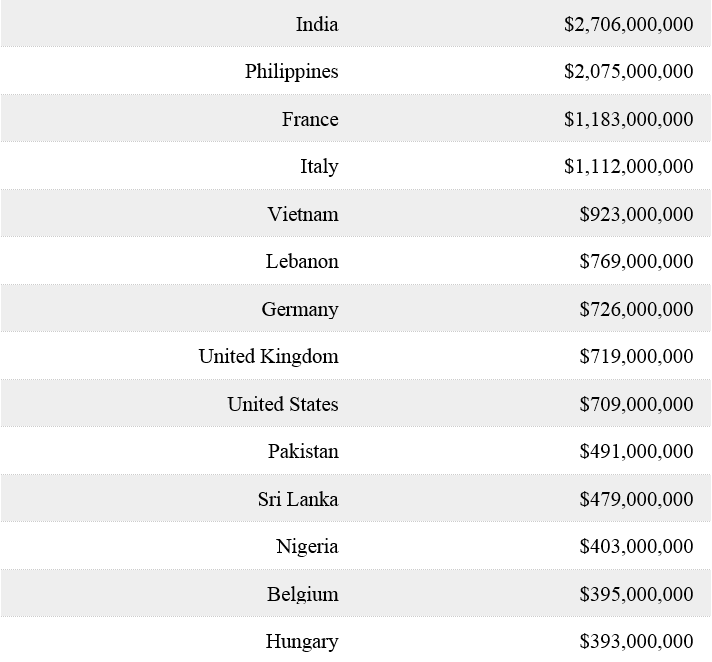 Here is the list of where the $23.4 billion dollars went from Canada as published (2015) by the Pew Research Centre. Financial institutions, like Cashco, work with companies like Western Union (WU) to administrate and carry out the transfers. WU’s history is long; 160 years, in fact. WU started as a telegraph company in 1861, creating the first transcontinental telegraph line. Fast forward just over 100 years and we find WU introducing the first commercial satellite in 1974. Rewind. Back to 1869. WU invents the stock ticker. In 1884, they were among the first eleven companies featured on the Dow Jones Transportation Average when the New York Stock Exchange rang its first bell. Money transfers are Western Union’s main revenue driver and have been since 1980. The company boasts over 500,000 agent locations worldwide in 200 countries. As much as it is predominant, it does have one competitor, a youngster called PayPal. PayPal is more of a basic payment processor and deals only with the banks such that they do not connect directly with the customer, which may appear to be confusing. In other words, they do not connect directly with customer s and Western Union does. By the way, Ebay bought PayPal in 2002. Western Union has been in the money transfer business for over 100 years. Western Union offers a suite of services. They send money online, by phone and in person. They also track money transfers worldwide and have a fraud awareness program. Most transactions these days are processed online. WU can send the money directly the recipient’s bank account and even to their mobile phone, but they also provide the opportunity for the recipient to pick up cash. In 2015, they sent over $150 billion to both consumers and business clients. For customers of financial institutions, they can go through their financial institution, such as Cashco, to access Western Union’s services including email transfers of money and money transfers using a pre-paid credit card. Your financial institution, working with Western Union, can help you enroll. Generally, enrollment is free as it is at Cashco. So, if you need to send money somewhere else and wonder how it’s done, call your financial institution. If you are a Cashco customer, call 1855-914-7940. You can also learn more at the Cashco website.